Yep. Another of my John Wayne set. C'mon. Who doesn't love that I have a John Wayne magnet set! Anyway, sometimes it feels like courage is one of those words that people throw around pretty lightly. But this magnet pretty much sums up my feelings about the subject. 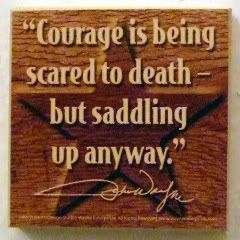 I was kinda thinking that I should earmark this magnet for when I see something truly courageous...but the more I think about it, the more I believe everyday courage is something to celebrate, too. It comes in many different ways, and I think you can see it anywhere you look. Whether it's a kid just making it through her standardized testing this week, or a guy working on an oil rig out in the middle of the Gulf of Mexico. Or, someone and their family facing life-threatening illnesses or even someone just leaving the four walls of their home.